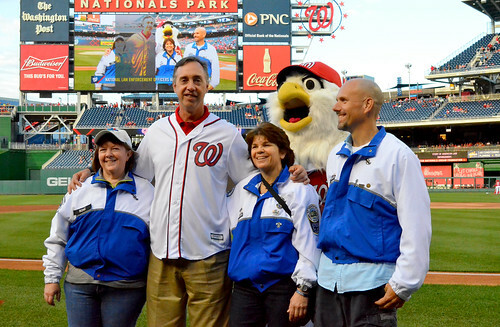 In the second game of a doubleheader, the Washington Nationals hosted law enforcement officers, their families and supporters on Saturday, May 14, 2016. Anne Arundel County State Attorney W‎es Adams joined Police Unity Tour members Maggie Deboard, Tim Benedict and Karen Bonz on the field for a pre-game ceremony. Shortly after 2 pm today, over 2,000 members of the Police Unity Tour completed their long journey to Washington, DC. Participants traveled hundreds of miles over the past three days to the National Law Enforcement Officers Memorial. Friends, family and supporters gathered at the Memorial, waving signs and cheering on the participants as they finished the long ride. The Police Unity Tour’s motto is “We Ride for Those Who Died” and is one that each rider seriously embraces. Participants not only trained hard for the 300 mile average ride but also raised money to provide awareness and financial support for the National Law Enforcement Officers Memorial Fund. After all riders had entered the Memorial, a brief ceremony was held, and the Police Unity Tour presented a check for $2.32 million to Craig W. Floyd, President & CEO of the the Memorial Fund. We thank all the members of the Police Unity Tour, who worked tirelessly to ensure the service and sacrifice of America's law enforcement heroes are forever remembered. Their generosity, commitment and unity are vital to honoring all officers killed in the line of duty. The Metropolitan Police Department (MPD) of Washington, DC, the Fraternal Order of Police DC Lodge #1, and the DC Chapter of Concerns of Police Survivors hosted the 37th Annual Washington Area Police Memorial Service at MPD’s Headquarters in downtown DC, with Shawn Anderson of WTOP News as master of ceremonies. This annual service recognizes the work of all DC Metro area law enforcement officers. Special recognition was given to those who made the ultimate sacrifice in 2015, including Carolyn Cross, Craig Chandler, Noah Leotta, and Brennan Rabain. Following the presentation of colors and the national anthem, introductory remarks were given by District of Columbia Police Chief Cathy L. Lanier, followed by remarks from Representatives from the DC Department of Corrections, Baltimore City Police Department, Montgomery County Police Department, and Prince George's County Police Department spoke about their officers lost in the past year, which was followed by a solemn roll call of fallen heroes from the DC Metro area. Survivors, law enforcement officers and friends placed blue roses as the names of the fallen were read. The names of the officers honored at the service today will be dedicated on the walls of the National Law Enforcement Officers Memorial at the 28th Annual Candlelight Vigil this Friday, May 13 at 8:00 pm, along with 252 other officers who have made the ultimate sacrifice. For more information about National Police Week 2016, including a complete schedule of events, visit www.LawMemorial.org/PoliceWeek. The constant mist on a cold night in May couldn’t keep New York Yankees fans from one of the biggest rivalries in sports. With the Boston Red Sox in town for the first time this season, scores of people traveled from all around the tri-state area for an exciting game on Friday, May 6, down to the final out. Hundreds of fans were also there in support of local law enforcement, as the Yankees hosted Law Enforcement Appreciation Night at Yankee Stadium. Fans traveled from as far away as Texas to watch the Yankees beat the Red Sox 3-2. They also saw a little more action that they had anticipated in the ninth inning as Red Sox DH David Ortiz was struck out with bases loaded, blowing a chance to tie or even win the game. An angry Ortiz, who had scored a home run in the first inning, immediately ran back on the field and accosted the umpire, giving everyone a story to take home that night. The National Law Enforcement Officers Memorial Fund would like to thank the New York Yankees for the opportunity to share this game with the local law enforcement, their families and supporters. A special thanks to David Sibelman and the rest of the Group Sales & Service Department. The Yankees will host another Law Enforcement Appreciation event on Sunday, September 11, 2016. Special discounted tickets will go on sale later this summer. Today, law enforcement officers and motorcycle enthusiasts gathered at RFK Stadium in Washington, DC for the 21st Annual LawRide to the National Law Enforcement Officers Memorial. Hundreds of motorcyclists cruised past the U.S. Capitol, down Pennsylvania Avenue, and up 5th Street on their way to the Memorial. Immediately following the ride, a ceremony was held and ceremonial wreaths were placed at the Memorial’s center medallion, to honor all the fallen heroes of American law enforcement. This morning, the Metropolitan Washington Council of Governments Corrections Chiefs Committee gathered at the National Law Enforcement Officers Memorial to honor correctional officers who have made the ultimate sacrifice. Since the Memorial was first dedicated in October 1991, the Metropolitan Washington Council of Governments Corrections Chiefs Committee has conducted an annual ceremony at the Memorial to recognize the service and sacrifice of our nation's correctional officers. The roll call of fallen heroes was solemnly read aloud as members of the participating honor guards carried red roses to the center medallion of the Memorial. After each flower was placed, a single bell tolled. In a traditional symbolic gesture, white doves were released at the end of the ceremony and a wreath was placed at the medallion. In 1996, Congress officially changed the name of the week to National Correctional Officers and Employees Week. These courageous heroes are forever remembered. Their light continues to shine through their memory and through the selfless men and women who continue to serve each day. 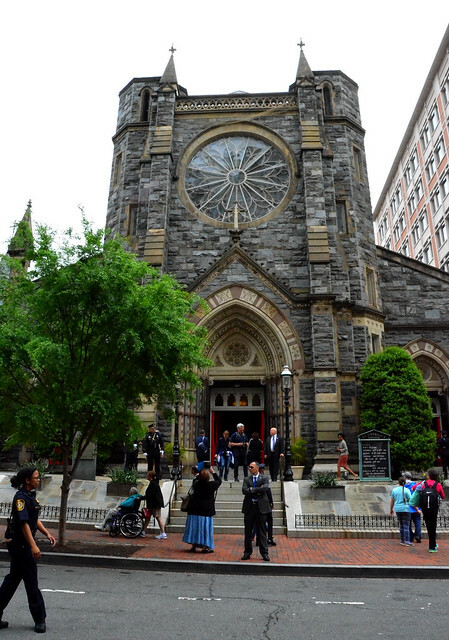 Photos from today's 22nd Annual Blue Mass at St. Patrick's Catholic Church in Washington, DC. Held each year at the beginning of National Police Week, the church prays for those in law enforcement and fire safety, remember those who have fallen, and support those who serve. Representatives of Federal and local law enforcement and public safety agencies from the Washington, D.C. Metropolitan Area and around the country attend.